Dulquer Salman started 2013 in a grand way with the two Malayalam movies reaching the audience the best possible manner. 'ABCD- American Born Confused Desi' was a youth entertainer. His role in 'Kullante Bharya', a segment in '5 Sundarikal' was very outstanding and the actor received appreciation from everywhere for making the character memorable. Both these movies were box office hits and the new star of Malayalam is looking for few more commercial hits in 2013 and the upcoming year. With all his movies making box office success he is on his way to new heights in Malayalam films. The upcoming Malayalam movies Dulquer Salman in 2013 are Sameer Thahir's 'Neelakasham Pachakadal Chuvanna Bhoomi', Azhagappan's 'Pattam Pole' and Lal Jose's 'Vikramadityan'. 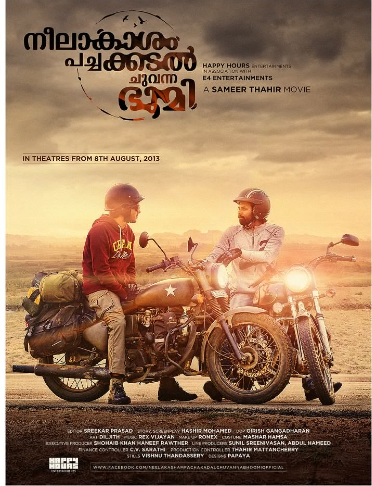 The highly talked' Neelakasham Pachakadal Chuvanna Bhoomi' is a road movie starring Dulquer Salman along with Sunny Wayne. Dulquer and Sunny Wayne together made their debut inMalayalam with 'Second Show'. The movie was indeed one of the best movie of the year. The get together of Dulquer Salman and Sunny Wayne makes 'Neelakasham Pachakadal Chuvanna Bhoomi' a most anticipated movie of the year. Dulquer dons the role of Kasi, an engineering student. Kasi is a lost soul. Some books inspires him to find himself through a journey. Followed by the events happening there makes him and his close friend Suni (played by Sunny Wayne) to make a bike ride to Nagaland. Manipuri actress Surja Bala Hijam makes her debut in Malayalam movies with NPCB. She does the role of Assi, a Nagaland girl studying in Kerala under North East quota. She is Dulquer's heroine in the movie. 'Neelakasham Pachakadal Chuvanna Bhoomi' is produced by the director Sameer Thahir himself under the banner of E4 Entertainment and Happy Hours Entertainment. The script is written by Hashir Mohamed. With its locations spanning 7 beautiful states - Kerala, Karnataka, Andhra Pradesh, Orissa, West Bengal, Nagaland and Sikkim, it will surely be a visual treat for the audience. The recently released teaser of the movie had further increased the expectation on 'Neelakasham Pachakadal Chuvanna Bhoomi'. 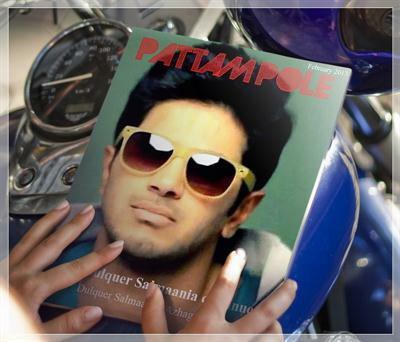 Dulquer Salman will feature in famous cinematographer Azhagappen's directorial debut 'Pattam Pole'. Dulquer Salman will appear as a Tamil Brahmin in this movie. A story of the young generation, 'Pattam Pole' revolves around a Kerala girl and a Tamil boy both living in Kerala. New face Malavika Mohan is the heroine of this movie. It is written by Girish Kumar. Archana Kavi , Nandhu and Anoop Menon are doing other key roles in the movie. This is the first time celebrated script writer turned Anoope Menon sharing screen presence with Dulquer Salman. Azhagappan himself is doing the camera work for the movie. The shooting of 'Pattam Pole' is already started in Kumbakonam in June 2013. The director wants to do a commercial film suiting to the current viewers. This will be another all-out commercial film from Dulquer Salman. 'Pattam Pole' is produced by Karunakaran under the banner of Carlton Films. Hit maker Lal Jose is the director of Dulquer Salman's new film 'Vikramadityan'. Lal Jose is at his best nowadays with all his latest movies getting positive responses from theater. Lal Jose's last movie was Immanuel, starring Dulquer's father Mammootty. 'Vikramadityan' will be penned by Iqbar Kuttippuram. It will be produced by Lal Jose himself under the banner of LJ Films. The discussion casting and other details about 'Vikramadityan' is under progress. There has been a rumor that Aju Varghese doing a key role in the movie. The shooting of 'Vikramadityan' will start after Dulquer Salman finishes 'Pattam Pole'. The grand successes of his earlier Malayalam movies does not force Dulquer to attempt more and more movies possible. He is slow, punctual and very selective in attempting the movies. That is what makes him a successful figure among the youngsters. Latest buzz is that he will be seen in a Tamil movie in a short while.